The Telektonon of Pacal Votan is also known as the Galactic Maya Gospel of Pacal Votan. It came out as a booklet containing 126 inspirational verses. This testament was transcribed by José and Lloydine Argüelles during January 1994 in Mexico. It was later included in the board game set “Telektonon: The Game of Prophecy” (1995). Note: Tortuga 13:20 has reconstructed this publication entirely and according to its original. We have proudly restored the name of Lloydine Bolon Ik as co-author and Archetypal Mother of the Galactic Maya Cosmology. We have also reconstructed the last two original chapters, available now for the first time online: “The Religion of Truth is the Religion of the Earth” and “Personal Statement to the World by José and Lloydine Argüelles”. In Lak’ech. and the righteous who do good. Ah, what a beautiful fellowship! the special witness of time and the last call. 5. O children of the people of the dawn, o children of the people of the book, I come as the special witness of time to remind you, especially on the day of truth, that in your origin you are one, and on the day of truth you are to make yourselves one again. For this I remind you of the Cube of the Law, Telektonon, and the 28-day, thirteen moon way which is the path of the righteous. 6. Nah Chan, Palenque, Xibalbay, Tollan, Xochicalco, Tepozteco, Amatlan: in these signs dwell my special agents, the witnesses of truth, 13.66.56 and Bolon Ik, Daughter of Job. 7. For those with eyes, with open mind and sincere heart, this teaching is complete in every stone alignment and marking of the star command base now called Palenque. 8. New Jerusalem is the Palace of Bolon Ik, whose number is 1728 (144 X 12), Cube of the Law. Seventeen is the power of Heaven, “solar Uranus,” which is Earth in Heaven. Twenty-eight is the power of Telektonon, the Spirit Tower of the power of seven times four. 9. Never forget, children of the day of truth: All is number. God is a number. God is in all. 10. And everything there in the palace is laid out foursquare from the cord of Heaven which is the command of the Telektonon. Divine word never uttered until the Day of Truth. And in that palace foursquare is the tower of the Cube of the Law. 11. O children of the day of truth, before the separation which divided you into the children of the dawn and the children of the book, there was only the Cube of the Law and the Law of the Cube. 12. Everyone and everything moved and lived within this Law: one mind, one spirit, one will. 13. Within the dimensions and measurements of the cube are all knowledge of Heaven and Earth. And in order to know, expand upon, and delight in the sublime Law of the Cube, God created you, o children of the day of truth. 14. And ‘though shaped of no more than mud and sounding clay, in you is the perfection of knowing the Cube of the Law, if only you remembered! 15. Children of the Day of Truth, just as the cube is the measure of the perfection of God’s thought, so you are the measure of the perfection of God’s unceasing movement which is called time. 16. In you the cube is the crown of perfect knowing of God’s will in time. But true to his word, Iblis made wrong fair-seeming. To show himself man’s enemy, Iblis split the cube. He drove a forgetting of time within the mind, separating mind from spirit, which is God’s movement in all things. 17. And from this forgetting in man, mind and spirit became confused. The will weakened. Ego was born. Iblis’s many headed self triumphed. False authority arose. Babylon came to be and in its centre the Tower of Babel, the monumental curse for no longer knowing time. 18. In the forgetting was the separation of the people of the dawn from the people of the book. Had there been no Tower of Babel, there would have been no Book. The Tower of Babel was a deceit intended to show the Cube of the Law existing outside of the perfection of knowledge already formed within you, o children of the day of truth. 19. Product of the forgetting, the Tower of Babel has a shadow of ever-darkening and all-encompassing dimensions that spreads 5,000 years from Babylonia to all Earth’s most remote wildernesses and mountain height retreats. Iblis’s curse of ego and false time are complete but hold only to the day of truth. 20. For God is gracious and most merciful. As long as he could, he kept the people of the dawn away from the Tower of Babel. And to both the people of the dawn and the people of the book, he sent many messengers, apostles of light, witnesses of truth, doers of the righteous way, which is always framed by the invincible Law of the Cube. 21. As the special witness of time, I, Pacal Votan, know the perfect count of days. I bow in the temple of the tower and the rock, the sanctuary of Bolon Ik. In my body, formed of the ultimate perfection of God’s power of all movement and measure (Hunab Ku), is the recollection that is prophecy. Knowing this body as the measure of time, I had built this palace and this tower to correct and to also look for the Tower of Babel, a memory of the remembering. And in my ninefold temple, where, guarded by the nine powers of time, I had this body laid, I left this legacy for you, the Talking Stone of Prophecy. 22. Telektonon, the frame of time I left for you, is a mirror to show you your own truth of time for one last time. For now is the day of truth, the hour of judgement. 23. You, children of the dawn, and you, people of the book, unify yourselves the only way you can: in time, through time, as time. 24. Telektonon, the perfection of time is the only way for you to escape the fire that consumes the unrighteous. If you who know, who have followed the straight way, the good path, now falter in this challenge of unification in time, Telektonon, which has already been prepared for you, you will perish forever in the fire that now consumes all unbelievers. God’s command is in you. Do not listen to the evil one now. 25. Listen! My knowledge is this: my count of days is perfect, my knowledge of the Cube of the Law is unsurpassed. Twelve is the number of the temple, but thirteen is the number of God. Twelve times twelve, 144, is the number of the perfection of the temple as light. And twelve times 144, 1728, is the number of the Cube of the Law, Telektonon, the divine word unuttered until now. 26. “…To him that overcometh will I give to eat of the hidden manna, and will give him a white stone, and in that stone, a new name written, which no man knoweth, saving he that receiveth it.” (Revelations 2:17) And that name is Telektonon, and that stone is crystal, and that hidden manna is knowledge of the revelation of time. 27. The number of the elect is 144,000. This was the number set aside by God to be free of Iblis’s curse. Dispersed is this number among mankind, and always was it meant to multiply both among the people of the dawn and the people of the book. 28. But, since a human kin is the measure of the perfection of time, 144,000 is also the number of days within a cycle of 20 generations. 29. Twelve times 20 generations is 1,728,000 days, the number of the Cube of the Law. But for God, one cycle more, 144,000 days more to entice Iblis to make his score, a total of 1,872,000 days, thirteen cycles of God’s elect. 30. I am Pacal Votan, time’s special witness, galactic agent of the Nine Great Lords of Destiny, by oath pledged to the honour of Bolon Ik. 31. In my body of time, thirteen star histories rehearse themselves for the day of truth. Each star history possesses its own knowledge keeper appointed by the Nine Great Lords of Galactic Destiny. Thirteen Wisdom Holders, Nine Great Lords, 22 in all, to each of whom I am bound by a luminous thread of knowing, sealed by oath to Bolon Ik, White Solar Wind, Kin 22 in the Book of Destiny, the Book of Kin. 32. All is number. God is a number. God is in all. 33. Child of the day of truth, listen: 20 is the number of totality. You have 20 fingers and toes because God has made you the totality of time. Thirteen is the number of God’s cosmic wisdom, perfect in its power of unceasing change and circulation. Thirteen are the joints of your limbs and body. Seven is the difference between thirteen and 20. Seven is the mystic perfection between one and thirteen. Seven is the erect spine of vigilance in which are met the 144,000 mystic fibres of the body’s thirst for prophecy. 34. 144,000 kin, 144,000 days, these are called a Baktun. Thirteen Baktuns, one perfect cycle to rehearse all thirteen star histories. Each Baktun, 20 generations, each generation 7200 kin. So it was that Bolon Ik ordained the sacred count of days, each day a sacred kin, each kin one of the elect, a turning in the twist of universal time, each kin ruled by the power of the nine, the power of the Nine Great Lords of Time. 35. So began the sacred thirteen Baktun count, 3113 years before the birth of the second of the special messengers, the Apostle Jesus Christ, who sent to you a book of Dark Prophecies, 22 sacred chapters in all, through his appointed witness, John of Patmos. 36. All this I know and declare to be true, for I am times special witness to the day of truth, Pacal Votan, rehearser of the thirteen star histories, he who adds the 144,000 elect to the cubing of the cube, assuring not twelve Baktuns, but thirteen to be the number to bring on the day of truth, God’s judgement of your power of remembrance! 37. Children of the people of the dawn, in separating you from the people of the book, God meant you to be the reminder that wisdom is already perfect in your bodily form of time. 38. In remembrance, many messengers did he send you, many fires did he light high atop the mountain for you to see. And one special messenger did he send, one special witness of the dawn. 39. In India, at the mid-point of the seventh Baktun, the very centre of the mystic cycle, thirteen Baktuns in all, Lord Buddha did awaken at the dawn, the morning star, the tree, the Earth, his witnesses of illumination. For seven weeks he sat beneath that tree. Never moving, he travelled the seven directions and visited with his mind every realm of God’s vast creation, only to learn the turning of the Wheel of the Law. 40. Withstanding all efforts of the evil one, he taught unceasingly for nine times five years more, until the age of 80. All mind teachings did he give; the unwritten Book of Enlightenment did he leave with the Earth. His last turning of the Wheel of the Law was the teaching of the Wheel of Time. Given at the request of King Suchandra of Shambhala who travelled far from Central Asia to receive this teaching, the teaching of the Wheel of Time closed the life of Lord Buddha. 41. “All composite things are impermanent,” declared Lord Buddha at his death, “Be a lamp and a refuge unto yourself, look to no outer authority but yourself!” The fire of Lord Buddha’s illumination lit many lamps. The Book of Enlightenment he left with the Earth is a book for all to know in silence with the Earth. 42. In Shambhala did King Suchandra transmit the teaching of the Wheel of Time, Kalachakra, as it is called. Invoking the Nine Great Lords of galactic destiny, Shambhala prospered in abundance and wisdom. When came the seventh ruler after King Suchandra, Queen Visvamati, the people of Shambhala ascended as one into the paradise of the fifth dimension, where their wisdom continues to water the rivers that flow beneath the gardens of the righteous. 43. Integrating the power of the five, which is the centre, with the power of the twelve, which is the root of the cube, the Kalachakra is also the cycle of 60 years (5 x 12). By the Law of the Cube, which is the power of sixteen, foursquare or seven plus nine, sixteen cycles of 60 years is the appointed time of prophecy, the prophesy of Kalachakra, which is the time of the day of judgement. 44. So it was that after the arrival in Tibet of Buddha’s special voice, Padmasambhava, late in the tenth Baktun, that the Lords of Shambhala determined to release the teachings of the Wheel of Time among the people of the dawn inhabiting Tibet. Thus it was that the Wheel of Prophecy turned the first of these sixteen cycles in AD 1027 and completed the sixteenth of these 60-year cycles in AD 1987, in partial fulfilment of the Harmonic Convergence of all prophecy. 45. O people of the dawn, do not doubt. The appointed day is come. 46. People of the dawn, people of the book, children of the day of truth. To safeguard as long as possible the teachings of the Original Ones from the confusion of the Tower of Babel, God divided the Earth by its one ocean into great island masses called continents. And most far from Babylon was Amerrikua, and also distant was Australia and the Island Kingdoms of Polynesia. Even in Africa, close by to Babylon, for many great cycles were the people of the dawn protected in their natural wisdom. 47. But inexorable is my count of days, inexorable the rolling of the Wheel of Time, inexorable is the Law of the Cube. 48. Telektonon is the name of the blessing received by those who master the Law of the Cube. Great is the power of God, whose power and blessing are ever close and near, foursquare the manifest action of radiance from the divine intersection of God’s presence: divine mind, divine spirit, divine will, divine source from which the Cube is sprung. Foursquare the Cube, the measure of Telektonon, one vast, far spreading word which is no word at all, but number multiplying itself from within God’s unending meditation, which we choose to call creation. 49. From one intersection, six directions plus the seventh, the moving centre of time, the naval of Heaven whose cord is a fibre called Kuxan Suum. From the naval of Heaven to the solar plexus runs the Kuxan Suum, highway that reaches to the roots of the stars, passing through each of the Heavenly dimensions. 50. I, who say this, know, for I am Pacal Votan, who left for you a talking stone, Telektonon. Times special witness am I, God’s spy holding vigil, keeping the sacred count of days, exposing to you the lie of Babylon, the falsification of the Cube into the Tower of Babel! 51. Who now but I can tell you that seven are the directions of the Cube, the Heptagonon of Mind: twelve are the gates, sixteen the powers, moved by the nine great powers of time, these sixteen powers become the number of the elect of the Cube, 144. Multiplied by the millennium, 144 becomes 144,000, sacred number of days I laid for prophecy to know during my first Baktun count. 52. Children of the book, even before the close of my first Baktun, 20 generations from the year, BC 3113, the foundations of the Tower of Babel were laid. Captive now were the 144,000 within the Earthly prison of Babylon’s materialism. 53. Yet by my devotion and power of mediation, from deep within the Earth, aided by Bolon Ik’s perseverance on far Uranus, Earth’s harmonic twin, I kept the sacred count of days, I watched over the movement of the sacred march of kin. 54. Four more Baktuns passed, and Babylon’s power was swollen with the loot of Empire. Despite the righteousness of Abraham and the Law of Moses, the shadow of the Tower of Babel only increased in size and darkness. 55. Came the sixth Baktun and Imperial Babylon was complete. Its seal of false time and power, taxation and armed expanse had fulfilled Iblis’s desire to degrade and ruin all humanity by making wrong fair-seeming. Fair-seeming now to amass wealth and power; fair-seeming to make a count of time by twelve months; and fair-seeming to regard the thirteenth moon with superstition and contempt! Fair-seeming to gather taxes and to pay them; fair-seeming to make war for the power of King’s; fair-seeming that birth and death must be paid for; fair-seeming that all power come from priests, Iblis’s most cherished of men. 56. O people of the book, lost to you was all memory of the Law of the Cube, slavery became your lot! But I am Pacal Votan, time’s special witness. Even before the coming of the second special messenger, Christ the Apostle of Love, by my free will and my knowledge of the power of seven, I laid claim to the Seven Seals of Prophecy that on the day of truth, Iblis’s curse would be finished and the righteous would triumph. And now the day of truth is come. Telektonon, the talking stone now speaks in a voice for all to hear. 57. By the seventh Baktun, the Seven Seals of Prophecy were stored in Earths special lodestone of truth, whose custodian am I. 58. By the eighth Baktun, Iblis had caused the Tower of Babel to speak more tongues in a growing clash of empires. Into this confusion came the Apostle of Love, crucified for driving the money-lenders from the Temple, misunderstood by the people of the book, finally to be absorbed by the Priests of Babylon, now Roman by tongue, who use this Christ as their emblem to spawn Iblis’s greatest evil, the total usurpation of Earthly Time. 59. One special voice did this Jesus have, a man named Saint John of Patmos, in whom the gift of prophecy was fulfilled. From my ark of universal time, Earth’s special lodestone of truth, rock of Heaven, attained by thirteen tones, I guided Saint John’s hand by the mystic power of seven. And so was sent to the world the Book of Dark Prophecies, Revelations, the Apocalypse, 22 mystic chapters, the first thirteen mirroring my thirteen great Baktuns, nine more for the Lords of Time, seven of these for each of Seven Years of Prophecy, and the last two to complete the visionary power of the righteous of the Cube: 144,000 times thirteen. 60. To those who can read they will find Iblis’s numbers 1260 and 666, well-known on the day of truth, for 12:60 is the ratio of the false time which makes martyrs of the righteous, and 666 the number of the beast who captures my thirteenth Baktun. 61. Children of the day of truth, children of the dawn, people of the book, all this can you hear in the stones of Palenque where in the tenth Baktun I took pure human form. Of the 27 books of the New Testament, the 27th is Revelations. 27 steps ascend to the Palace of Bolon Ik. This palace, New Jerusalem, is the mystic power of Telektonon, the 28th step, the power of seven sanctified foursquare. 62. Twenty-two chapters of Revelations are the 22 kin complete in Bolon Ik: thirteen for the power of time, nine for the Nine Lords of Time, whose forms still guard my ark of stone deep within the ninefold temple of the Cube of the Law. Perfect was the time of my coming, kin 1,366,560. Perfect was the time of my going, kin 1,385,540. 63. Installed in the House of the Serpent, my coming was commemorated by the departure of the third messenger, the special messenger of the day of truth, the Apostle Muhammad, who left for the righteous of the Earth, the Book of the Righteous, the Holy Qur’an, clear signs to understand. 65. I am Pacal Votan, witness of time. Telektonon is my gospel. The talking stone of unifying prophecy is my legacy intended for that special messenger who understands the meaning of my numbers. 66. By my symbolical channel of communication called Telektonon did I intend this prophecy to be discovered and recovered. Once 40 years had elapsed from the time of the discovery of my Uranian crypt, then would come the recovery, the recollection by my special agent of the numbers rehearsed and repeated to announce the day of truth. 67. Perfect was the time of my coming. Perfect was my mission. Perfect was the time of my going. Perfect is the discovery of my prophecy. Perfect is the Telektonon, the little book the angel of the Lord made Saint John of Patmos taste and eat, which you now possess, a treasure for the day of truth. 69. Seven katuns are there to follow me. Seven generations, each one guarded by a solar witness taking account of what you do, each solar witness sealing your time with a prophecy to be known as the Book of the Seven Generations. And this book is to be opened for the day of truth. 70. After the seven generations, the end of the Baktun. Ten Baktuns gone, the glorious Age of Maya gone, the long count of my days to be completed at 1,440,000 kin, the mystic number of the elect, multiplied by ten. 71. Then will come the three Baktuns of Babel, the coming exile of 12:60 time. Thirteen years after this tenth Baktun shall come the last prophetic round: thirteen cycles of Heaven, each 52 years, followed by nine cycles of Hell, each also 52 years. When the third round of Heaven begins, the Messenger of the Last Call will come to you, Quetzalcoatl-Kukulkan, the prophet by name. 72. And when the thirteenth Heaven cycle is over, then will come the complete destruction of all we are and know. Before the twelfth Baktun is over, two priests bearing false witness, ornamented with the sacred numbers five and thirteen, will see to it that the thirteenth Baktun will be the end of time. 73. Unrelenting will be the roll of the Nine Hells into the Abyss of fire and madness. In the time of the last Hell, though you will be declared free, free you will not be. Ten Kings in succession will mark the climax of time. Seven years will follow the ending of the last Hell. Then will sound the angel of the seventh trumpet, the seven thunders will roll, the beast of seven heads called G7 will place his mark on your foreheads and hands, the false one from Babylon will return to be embraced by the 11 Serpent. Then the day of truth will come, the seven years of prophecy. 74. People of the dawn, people of the book, children of the day of truth, many messengers have been sent to you, many prophets have been given to you. A Book of Enlightenment has been placed in the Earth for all to read in communion with the Earth. A book of Dark Prophecies has been left for you. A prophecy of thirteen Heavens and nine Hells to accompnay the book of Dark Prophecies has also been left for you. A great prophet and messenger has left you clear signs to understand and a book of unassailable righteousness, the Holy Qur’an. 75. As the special witness of time, I have left for you my talking stone, Telektonon, breath of precious Bolon Ik, and have sent you both a prophet, Quetzalcoatl of sacred Xochicalco, and for the day of truth I have appointed a special messenger who can hear my talking stone and write and explain its numbers and its meaning for you, children of the righteous. 76. Do not doubt any of this. When the moment comes for him who is to be the eleventh in succession, to succeed the one, 11 Serpent, then join the believers and begin the prophecy that liberates from all Kings and successors. 77. Ten witnesses I place around my tomb, ten Uranian emissaries, one each for each of the ten Baktuns. Of these I am the eleventh. Who would be the eleventh of the final succession of the Kings of Mexico must own me as the eleventh, then will all go well. 78. Six messengers did I place on my talking stone of prophecy, three above; the messengers Lord Buddha, Muhammad, and Christ, and three below; Padmasambhava, Quetzalcoatl, and Saint John of Patmos. Of these I am the seventh. 79. Pacal Votan am I, time’s special witness, messenger of the Telektonon, instrument of the seventh angel, I declare again and again: All is number. God is a number. God is in all. 80. Look carefully at my stone and listen: ten messengers, 24 signs, for ten are the number of orbits of planets around this star, Kinich Ahau, your Sun. From my point of origin, your star is designated 24, number of the circuit of externalizing intelligence. If you are of the righteous, then in this is a sign for you of your star mission. 81. And from each of the three oracle mouths of the arms of the cross on my Kuxan Suum, you will find 24 rays repeated three times, one half the number of the elect (3 X 24 = 72). Add to this three times eleven (33) and the number is 105, the difference between the number of days in your solar orbit, 365, and the number of kin in my sacred count, my galactic spin, 260. 82. 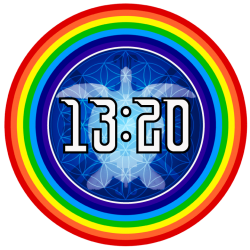 13:20 is the ratio of natural sacred time. 12:60 is the ratio of the false time of the Tower of Babel. 13:20, thirteen moons, 20 fingers and toes. 12:60 twelve month year, 60 minute hour. Children of the day of truth, in this is a sign for you to discriminate between the power of the evil one who seeks to trap you in his machine, and the power of the righteous who need nothing but that which God has endowed them: their body of time and their natural path synchronised by thirteen moons. 83. Children of the day of truth this is your only decision, for God knows and sees all that is in your hearts. People of the dawn, people of the book, on the hour of judgement unify yourselves in the only way you can: in time, as time, through time. For this in the year of kin 144, Telektonon is revealed to you, God’s plan for peace on Earth, the last and only hope for spiritual renewal and salvation, immediate acceptance and adoption of the 28-day, thirteen-moon way, the calendar Telektonon. “And he had a name written that no man knew but himself.” (Revelations 19:12) And that name is Telektonon. 84. Children of the day of truth, people of the dawn, people of the book, foursquare is my talking stone, invisible its design, its crystal lacing of star histories met in my human form. Time’s special witness am I seeking apostles of time to organize the day of truth into the revelation of God’s redemption. Universal forgiveness awaits those who understand God’s plan, a common time of 28 days-thirteen moons, begun together at the appointed hour, on the day called Lunar Moon, the first day of the second year of prophecy. 85. Two solar faces are there upon my talking stone, the one an icon of my solar shield, Galactic Sun, the other, Lunar Sun, an emblem of the perfect timing of Earth’s solar orbit. 86. Children of the day of truth, the hour of judgement has come for you. How much longer do you need to suffocate in the Babylonian exile of 12:60 time? My children are the oppressed. Is it not time for the war of the righteous to restore equality? Why not wage war then that destroys altogether the old time? Why not smash the caskets of the Babylonian wine of the fornication with a single stroke. 87. O children of the day of truth, people of the dawn, people of the book, in your origins you were one blood, today the hour of judgement demands you become one again, unified in time. Who among you will join my apostles of the Telektonon? Already the gift has been given. Already we left for you the 13:20 tool, my sacred count of days, 260 Kin, to turn the solar-lunar wheel of 365 days. And when the prophecy was vindicated at the conclusion of the ninth Hell, we sent among you the perfect form of the gift, Dreamspell, containing the message of the thirteen moons. 88. But this was not enough, the seventh trumpet had yet to sound, and so it did in the fortieth year following the discovery of my Uranian ark of stone. And now my prophecies are revealed. The Mayan Apocalypse of Kin 144, Yellow Magnetic Seed, turns the seventh year of karmic destiny into the opening of the first of my seven seals of prophecy. 89. In this seal foursquare, all prophecies converge. The beast of the G7 stands revealed. The Babylonian Vatican is exposed. 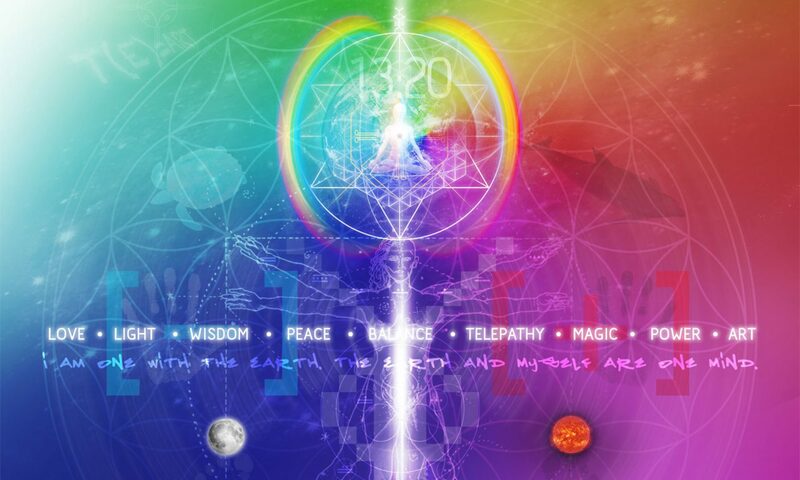 In the rainbow dream vision 144,000 of the elect are called again to meet in gathering together circles, to listen, to sing, and to dance to the song Telektonon. 90. O children of the day of truth, people of the dawn, people of the book, seven is my sacred power. Foursquare seven is 28, the number that, perfectly followed, opens Heaven’s gate. Walking together the sacred thirteen moon-28 day way, you will be joined to God’s command, a holy victory march of the righteous to restore sacred order to this troubled Earth and to recover your lost powers. 91. Four powers of seven are given to you to be your comfort in the Victory March, one power for each of the four perfect weeks, every 28 days. By the first power of seven, claim your power of prophecy; by the second power of seven, maintain your power of prophecy; by the third power of seven, proclaim the victory of prophecy; by the fourth power of seven, become the victory of prophecy! 92. O children of the day of truth, 144,000 times thirteen is an army of the righteous. Learn again the sacred count of time and join this army. O children of the day of truth, realize that everything about the old 12:60 time is now become a garment of false being, a moral corruption, a banquet feast for the evil one. 93. O children of the day of truth, children of the people of the book, in the Storm is the sign of God’s power. To the Storm is assigned the power of nineteen, the mystic saturation of all number. 114 Suras, nineteen times six, the power of the Cube, are the number of Suras in the Holy Qur’an. 22 years after the finding of my Uranian crypt, Telektonon, came complete revelation of the Qur’an’s power of nineteen, Allah’s mercy. Nineteen more years then to unfold the karma of Allah’s prophet besieged by Babylonian conspiracy. Then comes the destined year nineteen, kin 144, hour of prophecy’s convergence, moment of the day of truth. 94. Let the 124,000 messengers call forth a remnant of 20,000 more; let each one of these sound seven trumpets, seven times. Let these seven times seven trumpets call for a following of God’s perfect plan. Mark seven times seven years since the evil one showed his fiery face at Hiroshima. Be honoured by God’s cancellation of Iblis’s power of moral oblivion. Let the storm of God’s power of nineteen cleanse with cosmic mercy, the blood of all martyrs from the thrones of Kings, and let these thrones themselves be dissolved by the pure water of sacred time flowing through the gardens of the righteous. 95. I am Pacal Votan, time’s special witness, revealer of the Cube of the Law, devoted patron of the mystery that is woman, the consummation of the telepathic power of 28, known to me by name of Bolon Ik. 96. Pacal Votan am I, enigma to your men of reason. My existence is proof of the workings of higher law. Telepathy is participation in God’s knowing, but is no cause to claim full knowledge of his powers. Prophecy, too, is natural law, the compliment to God’s mercy. 97. 0-19 is my code. In it are all demonstrations of the wisdom that is always close and near, but which comprehends the web of galactic being and all forms of its natural orders in time. Just as nineteen is the power of God’s mercy, so zero is the fullness and emptiness all at once which characterize the nature of mind and all it can know. 98. Lord Buddha called this power of zero, Sunyata. The special voice of Buddha, Padmasambhava, whose life span followed mine, exactly as Muhammad’s preceded it, knew this Sunyata to be the basis of non-ego. 99. If you would know me and all that I witness for you in this hour of judgement, children of the dawn, people of the book, then practice the being that is non-ego. 100. Because I repose on Telektonon, the mother of all prophecy, mine is the ecstasy of deliverance. With a mind of non-ego clasped to the heart of God I have sent out my message of the Mayan Apocalypse. By relinquishing the calendar of twelve and leaving the prison of mechanized time, God’s mercy will come swiftly to you. 101. Thirteen moons, 20 fingers and toes, thirteen joints, four limbs, five senses do you already possess. God’s knowing and power of movement are already in you like a Mother pregnant with child. 102. Why tarry now? When a house is burning, scurrying for your possessions will only cost you your life. This house that is burning is Babylon, the 12:60 way of life, which is now destroying your biosphere and poisoning everything about your life. Do not linger now fondling your machines. This is the day of judgement. If you can remember, leave this burning house and know that a better way has already been prepared for you, a holy victory march, my seven years of prophecy, Telektonon, the sacred revelation of time. 103. The Cube of the Law is awaiting its construction through the collective mind, spirit, and will of you o children of the day of truth. Iblis, Satan, the evil one is none other than your ego clinging to the fatal lures of Babylon. God knows nonetheless exactly what is in your heart. Why not then become an apostle of the holy victory march? The ecstasy of deliverance is meant to be shared by all. 104. Pacal Votan am I, time’s special witness am I, who bequeath to you a talking stone, a legacy of place, Nah Chan, House of the Serpent, by prophecy known as Palenque. 105. And at Xochicalco, too, you will find stone utterances of my gospel left by command of my apostle, Topitzlin Ce Acatl Quetzalcoatl, who closed Christs first millennium, as now my prophecy is come to close Christ’s second millennium. 106. O people of the dawn, people of the book, children of the day of truth, make yourselves as one again and do not doubt the accuracy of the appointed hour on the day Lunar Moon! Synchronise now, and in all humility accept God’s plan, 28 days, thirteen moons, plus one day for deliverance and forgiveness. 107. Pardon now in public your enemy’s indiscretions, and make full confession of your own transgressions. If you are sincere, God will see this in your heart and by his mercy many will follow your way; and if you proclaim for the cause of righteousness and truth, a new beginning and a new time, Telektonon, the thirteen moon way, and you enjoin others to do likewise, then God will know this, too, and make you a great general in the holy victory march. 108. And, if you have means and wealth, and you hear these words, or have explained to you the curse of 12:60 time and the blessing of 13:20 time, then do not doubt it and practice charity. Provide for the children orphaned by war and provide for the reconstruction of the Earth, and that the practice of art and culture will flourish once again. Practice such charity with zeal, for soon you shall see an end to money. No more will flow the drunken wine of Babylon’s fornication, and then what will you be with your paper credits and your useless machines? 109. The prophets of peace are awakening. Truly, the hour of judgement is come. Among the angels I am known as the mysterious benefactor of the righteous. Will you throw away this opportunity, too? Beware for now the fire that consumes all falsehood is raging. 110. People of the dawn, people of the book, children of the day of truth, because I am time’s special witness, everything about my talking stone of prophecy is in fulfilment of God’s divine plan. 112. Eleven sets of triple disks, 33 in all, will you find upon my stone, for 33 is the number of the initiate, the middle harmonic of 65 that constitutes the Tzolkin, my sacred count of thirteen times 20. All clear signs have I left for you, two borders of stars, the host of the Nine Lords of Time repeated by number on each side, top and bottom of my stone, a ledger of star histories complete in my form. 113. But especially would I have you look at Mars and consider again the disposition of the thirteen sacred signs placed around the edge of my stone, from 8 Ahau, my seal of truth, to 13 Cimi, the galactic closing of the wizard’s hoard of the lore of death. 114. Ten emissaries celebrate the glory of my gifts for you, signs of peace from other worlds that beckon you to awaken from your sleep of Earthly Hell to join yourselves to God’s command, Telektonon, the 28-day, thirteen moon way and find in that count of days a path that leads directly to the paradise which is the repose and reward of the righteous. 115. 140 is the number of the Telektonon, perfect its ratio 5:7 (28 X 5 = 20 X 7), the same as my sacred ratio 260:364(+1). 116. All is number, God is a number, God is in all. 117. People of the dawn, people of the book, children of the day of truth, this completes my testimony, I, Valum Votan, holder of the solar shield, protected have I been by the perfect love of Bolon Ik who has stored my prophecy until this moment of release. 118. Seven perfect oracles have I given you, a perfect calendar of thirteen moons, an instrument to renew your spirit and your powers of Prophecy, Telektonon, and a book of knowledge for you to penetrate the forgotten history of your star, Dreamspell. Also have I sent two messengers who bear witness to my truth, and thirteen perfect signs. 119. Now is the time of my prophecy. Now is the day of truth. Now is the opening of the seven seals. Now is the sounding of the seven trumpets. Now is the hour of judgement. Now is the song of the 144,000, the seed army of the righteous. 120. When the Lunar Moon has overflowed its banks, the G-7 will be no more. 121. When the Electric Wizard arrives, gather in banners of righteousness. 122. When arrives the Self-existing Storm, you will be fortified with spiritual abundance. 123. When comes the Overtone Seed, neither money nor priests will besiege you any longer, but the Earth will sing in harmony with your righteousness, Babylon will be no more, the Law of the Cube will be fully rehearsed in the hearts of the righteous. 124. In the sign of the Rhythmic Moon, senses will open to the manna of Heaven; nowhere will you find any longer signs of the evil one, a cosmic race will you be once again. 125. And when comes the seventh year, the Resonant Wizard will seal the Heavens and the Earth with the glory of all prophecy, the redemption of all prophets, messengers, apostles and witnesses of truth. 126. Five years then will you have to close the cycle of the Seed, and another eight, thirteen years in all, to prepare for the coming of the Galactic Seed, 2013 Arcturus Dominion, the fulfilment of the star cycle Valum Chivim, witnessed by the special agent, Pacal Votan, to the glory of love, Bolon Ik, and on behalf of the mercy of God’s divine plan, Telektonon, Cube of the Law, the mighty talking stone of prophecy. “Man is one. Culture is indivisible”. It must be asked: What is it that will help the people and at the same time help the Earth? The religion of truth and the religion of Earth must be one: people of the book reunited with the people of the dawn. This can only be done by placing everyone in a new, common time that is in tune with the cycles of nature and the Earth. This is the universal harmony accomplished by the Thirteen Moon 28-Day Calendar Change. The religion of truth is the religion of the Earth. Earth needs a religion of truth that is not dogma, not money, not sect, an not anything defined by boundaries, paper, or selfishness of any kind. Only truth will satisfy the Earth. If asked: Of what religion are you? Answer: I am of the religion of the truth which is the religion of the Earth. The Thirteen Moon 28-Day calendar Change is a fundamental change. It is not a legislative change, but a change mandated by divine authority that transcends and unifies all sects and creeds in a higher calling of the Earth. Planetary service is the basis of the new time. Ask not what you can do for yourself, your religion, or your country, but what you can do for your planet. New groups of planetary servers are needed to transcend dogmas of money, nationalism, and sectarianism of every kind, who yet understand the fundamentally spiritual nature and divine unity of all creation. Calling all planetary servers, those who can walk a Planetary Service Wavespell together on behalf of the Earth beyond creed of self, sect, country or dogma of any kind, free in spirit, knowing no authority but the one divine spirit of all creation! Planetary servers, wizards of the Earth: the Earth is calling for all wizards to work a Planetary Service Wavespell. The Earth is recruiting now for duty beginning White Electric Wizard, July 26, AD 1995, the wavespell of planetary servers in action for the Earth. The religion of truth is the religion of the Earth, a hoop big enough to gather all the nations beneath the flowering tree of the divine revelation of time, thirteen moons, 28 days, the planetary service wavespell path of human redemption and Earth regeneration. Universal harmony, unification of all in common time, peace on Earth every day of every year, thirteen moons- 28 days. The time is now! and the entrance into the new. The old can only end in self-destruction. The new can only be entered into by a single gate in time. Thirteen Moons is the path. The gate can only be opened by the 144,000. The path can be walked by all. This is the time of the Great Purification. The Moon is split in two. Year of the red symbol. Temple of Inscriptions at Palenque, Chiapas, Mexico. (End of Publication. Page 60). Puedes encontrar en Amazon o Mercado Libre ? Ich leite seit 1999 eine Maya Arbeitsgruppe und habe Lloydin und Jos’e in Oesterreich bei Johann Koessner kennengelernt.